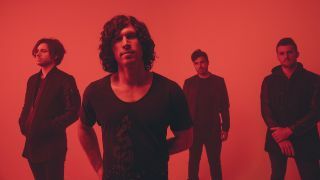 Nothing More have shared a new video for their track Do You Really Want It?. It’s taken from the band’s latest album The Stories We Tell Ourselves, which launched earlier this year via Better Noise Records. The video features live footage of the San Antonio outfit mixed with the Tiny Planet app to give a fish-eye lens, bubble effect. Frontman Jonny Hawkins tells Billboard that the effects in the video show the idea of people wanting to change the way the world is but get caught up instead in their own bubble. Nothing More’s track Go To War had been nominated in the Best Rock Performance and Best Rock Song categories for next year’s Grammy’s. The band are also on the shortlist for Best Rock Album for The Stories We Tell Ourselves. Nothing More will head out on tour from next month across North America. Find a full list of their tour dates below. Who the f**k are... Nothing More?